How to stop your motorbike from getting stolen - top tips. What’s really hard? Getting your pride and joy (motorbike) stolen. What’s really easy? 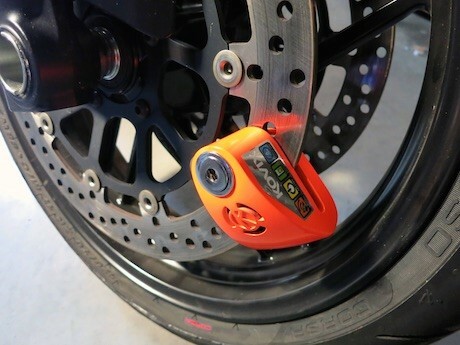 Making sure your motorbike is more secure and better protected. You must also appreciate that security is based on a number of factors, so for example, just simply investing in a new disc lock is definitely a start, but not the answer. Should a professional and skilled thief desire your motorbike, there’s nothing you can do to prevent him from taking it. There’s no chain or cable that can’t be snipped, no alarm that can’t be beaten and no garage door that can’t be sprung. However, what you can do is make your bike as difficult and time consuming as possible to steal, meaning a thief is considerably less likely to bother when easier targets are available. The best way to succeed is through layers of security. A single lock, even if it’s a premium quality one, presents just one obstacle to a would-be crook. A well illuminated parking space with alarm and locks on both wheels will combine to make a significant deterrent. Exactly how and why do thieves steal bikes? Few thieves are interested in riding your bike away from the scene of the crime, unless they’re just responding to a moment of opportunity such as an unattended bike with keys in the ignition. They are more than likely stealing to order and using a van for the getaway. Most bikes are simply stripped down for parts after a theft, not only is the motorcycle then impossible to trace but also the thief is not really worried about damaging it. Using a van means the theft takes only a few seconds; they just crop whatever lock you’re using, pick it up, then throw it in the back and drive off. Because they’re usually looking to sell parts, thieves prefer popular bikes that are commonly damaged and have expensive components. Sports bikes are the main target (especially Japanese ones). They’re the biggest market for things like swing arms, frames, engines and various other components. Or as the popular saying goes “out of sight, out of mind”, if thieves are looking to steal a specific bike and can’t see it, they won’t know it’s there. 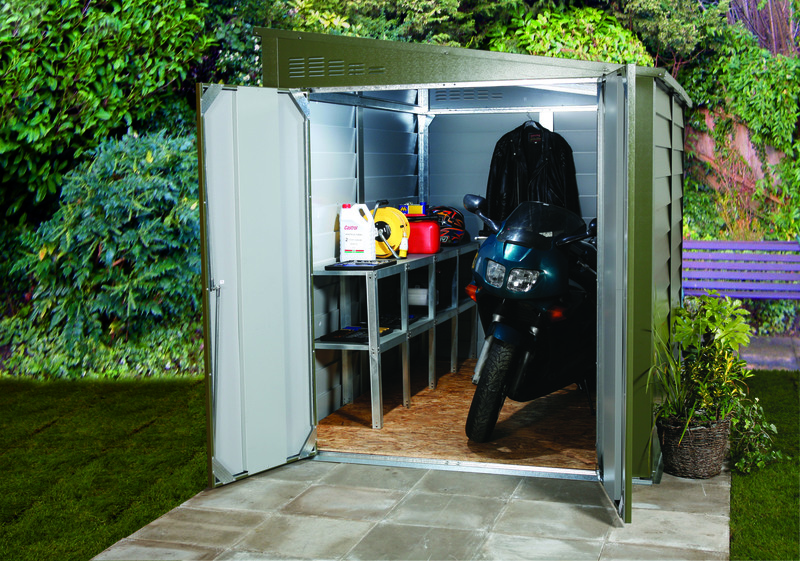 Brick garages are great but bespoke metal motorcycle garages are the ideal solution, why? – because most brick garages are multi-purpose these days and are used for general junk, bicycles, washing machines, tools and garden equipment. If a brick garage is the only option then also invest in a good quality bike cover (not a plastic sheet which will trap moisture and promote corrosion) that will guard against scratches and scrapes – but not against heavy items falling on it. Safety is also an issue, not only is the motorcycle full of petrol but it has the potential of toppling off its stand if people or children are accessing items around it. 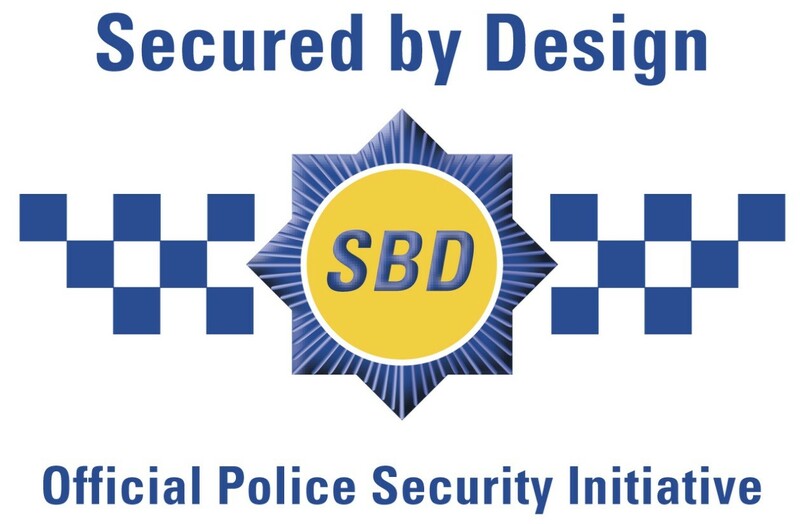 Premium bespoke metal garages are really worth considering, especially those which are insurance approved – always look for SDB (Secured By Design) accreditation which means the product is Police Approved and has been professionally tested to ensure the highest level of security. Do not be tempted to purchase a cheap alternative as it will not offer the same level of security and will likely corrode very quickly. Top quality metal garages should have a minimum of 25 year corrosion warranty, be fire resistant and maintenance free – they should also include multiple locking systems, alarms, ground anchors and heavy duty chains as standard. Locking your bike will help prevent it from being stolen, but many riders use locks inconsistently or improperly. Preferably your motorcycle should always have strong locks on both the front and rear wheels and be secured to an immovable object. But, that’s not always realistic and in real life it is difficult (and sometimes dangerous) to transport bulky chains and padlocks with you. What are you going to pass the chain through? Wheels are fairly straight forward to remove and a bulky chain won’t fit between a modern aluminum frame and engine. Make sure the compromise between what you’re passing the chain through and the strength of the chain doesn’t jeopardize security. Also consider if the object you are looping the chain round is really immovable. A £150 security chain is great until you pass it through a chain link fence that can come apart in seconds. At the least, aim to make the bike as hard as possible to move. It’s true that two strong thieves can pick up a sports bike, but can they maneuver it awkwardly into a van? A basic disc lock clamped around a brake disc can help. This should be viewed as a most basic layer of security. If your bike is out of your sight even for a short period of time have the steering lock on and something restraining at least one of the wheels. With chains, it’s not worth using one unless you’re locking the bike to something. In most cities you will be unable to regularly park on the pavement or in the vicinity of an immovable object. However one solution is parking next to another motorcycle, if it has a chain fitted, you can lock to it. You will just be looping chains so either can choose to uncouple at will. If you find something solid to lock to then do it properly. Remember to eliminate slack from the chain by doubling it around the anchor or whatever you’re locking it to on the bike. Don’t rest the chain on the ground where it can be easily attacked with a hammer and chisel. The least slack and as little distance as possible between the bike and object will make it difficult to attack with a grinder or bolt cutters. A chain around one wheel, connected to a solid object, with a disc lock on the other wheel is about as secure as you can make a bike if you’re parking away from home. It is obvious but always buy the best quality locks and chains which you can afford. But also do your research, look online and in magazines for product tests, you may find that the best option is not necessarily the most expensive. Remember that a padlock should enclose as much of the shackle as possible to prevent bolt cutters from attacking it. With a chain attached there should be little or none of the shackle showing. Thieves may also try and attack the padlock itself by drilling the cylinder out. Look for locks where the cylinder rotates or is otherwise resistant to this type of attack. For the chain, thickness, shape and materials are the most important factors. It seems obvious that very thick links will be stronger, but consider the alloy they’re made from (you need boron, carbon and manganese in the steel). Never just buy a piece of chain one from a hardware store, it will not be designed for high level security. Disc locks are less important. They are an initial layer of security and are more of a visual deterrent. You’re just looking to add a basic level of difficulty as simply picking up the bike is the likely solution for thieves. Remember to take the lock off before you ride away – simply placing a coloured elastic band around the twist grip can remind you to do this when you return to the bike. Always look for a recognised standard on security products, such as Secured By Design (SBD) – Official Police Preferred Specification, Loss Prevention Certification Board (LPCB), Sold Secure or Thatcham. At you usual place of parking (at home and at work), and definitely inside a garage, you should install an anchor. Again, do you research and purchase the best you can afford; remember that there is no point in having expensive locks and chains if the anchor you are securing to is not strong. There are many ground and wall anchors available, ideally they should be bolted into solid concrete (rather than tarmac or asphalt), but bolting into brick (walls) may be the only option for you. If you live in a flat with a parking space then ask the landlords permission to place an anchor there but remember, by the very design, they may be difficult to remove if you move. A properly fitted alarm can act as a significant deterrent to thieves, but it’s also true that a strongminded thief can take a bike and then rip the panels off to get at the shrieking siren. However most thieves will select easier targets when they see the flashing red warning light and also get scared off when the siren starts. There are several options available, from basic alarms that a competent home mechanic can fit, to complete immobiliser systems. 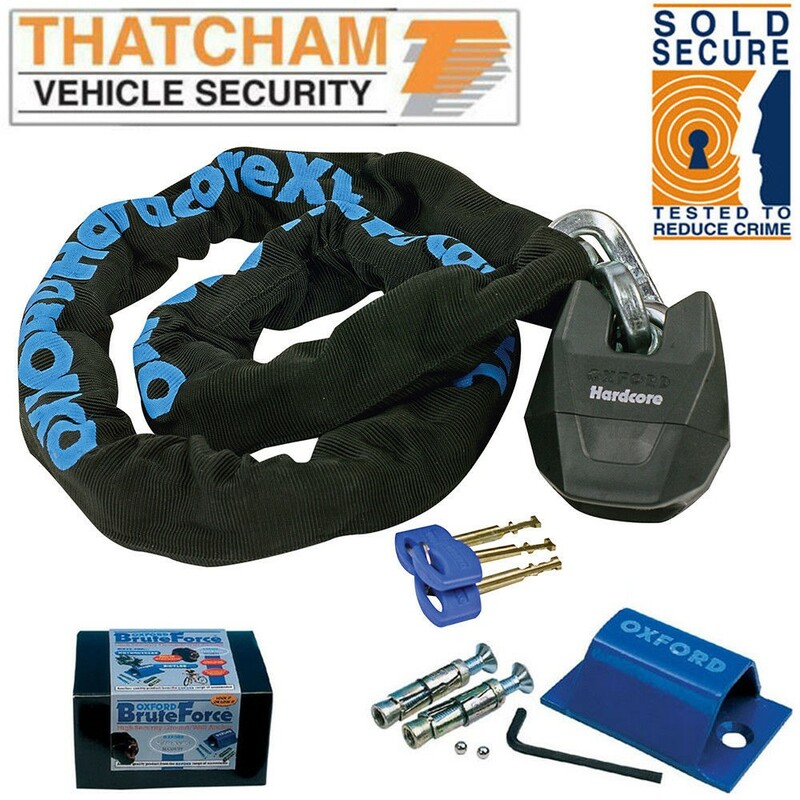 Some insurance policies insist on a Thatcham-approved immobiliser, depending on your bike and where you live. While your machine may well have its own alarm from the factory, some manufacturers don’t use Thatcham-approved systems. Probably the most important security consideration is the location of where you park your bike. We have already mentioned that home garages, and more specifically dedicated secure metal garages, are the best option for storage at home. You should, of course, also be very cautious of where you park your bike when out and about. Always keep to well-lit areas which are in good view of the public, although potential thieves can see your bike so can everybody else. Try to park next to other motorbikes if possible and also place a lightweight cover over the top – although thieves can remove this fairly quickly there is a hassle factor and they may draw attention to themselves in the process. Some carparks have dedicated motorcycle parking areas with CCTV coverage – use these even if you have to pay for the privilege. I hope that these ideas will prove useful and make you consider how to protect your motorcycle investment. Remember to always use multiple security strategies and to keep you bike out of sight when stored at home. Keep safe and enjoy your motorbike. Keep your bicycle secure and safe from thieves! 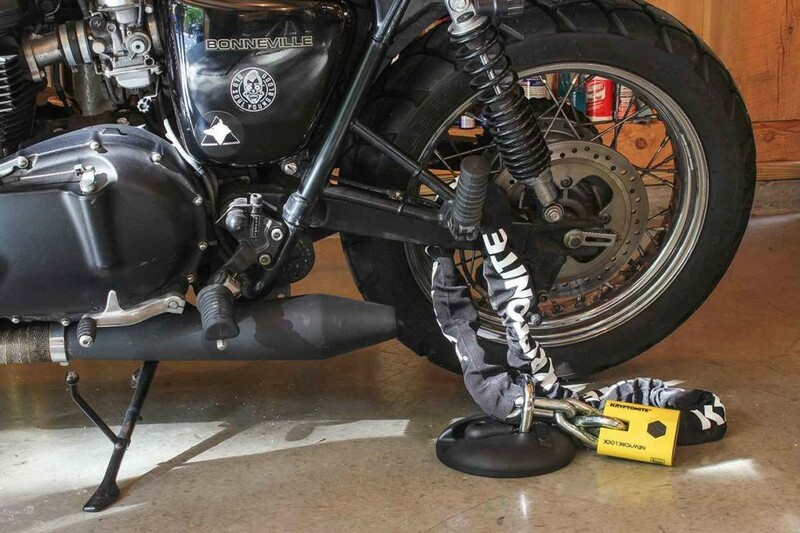 Getting your motorbike ready for spring and beyond. Where’s best to keep your bike?